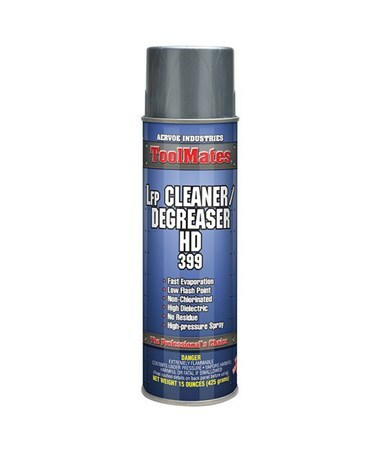 The Aervoe ToolMates Low Flash Point Aerosol Cleaner / Degreaser (12-Pack) is a high-delivery solvent formulated to remove grease, wax, oil, adhesives, and other contaminants without leaving any residue. It can be used on motors, tools, metal parts, machinery, and other equipment to ensure long-lasting efficiency. 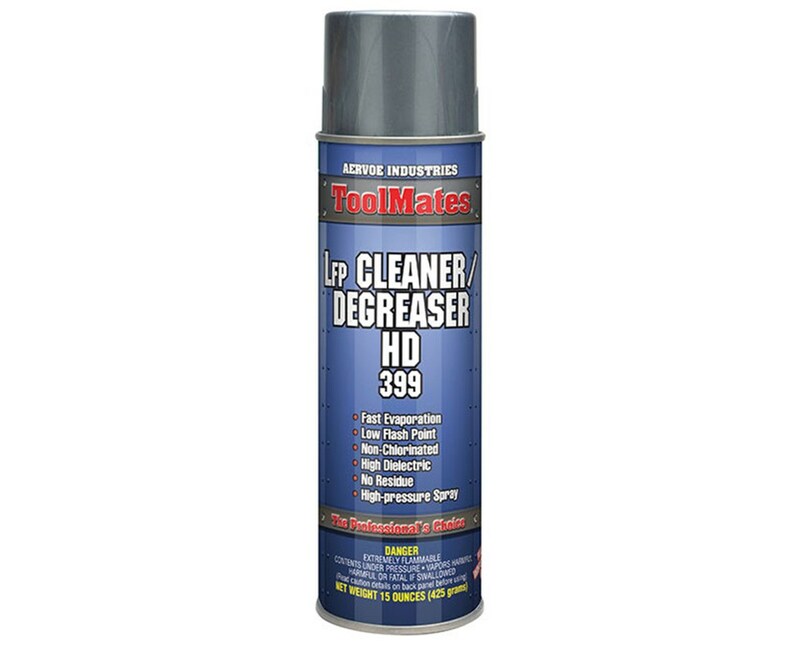 With its high-pressure spray action and excellent wetting action, it penetrates deeply into hard-to-reach cracks and crevices for complete cleaning and degreasing. This cleaner and degreaser by Aervoe features a non-conductive and non-corrosive formula that contains no chlorinated solvents. It offers a high dielectric strength of 33 kilovolts per millimeter and is safe for non-heat electrical exposure. With its low flash point (LFP) of <20 degrees Fahrenheit (-7 degrees Celsius), it is not recommended, however, for use on hot surfaces and energized equipment. This industrial-grade cleaner evaporates quickly and displaces moisture. The Aervoe ToolMates Low Flash Point Aerosol Cleaner / Degreaser (12-Pack) comes in 20-ounce spray can with an extension tube to allow easy and accurate application. For best flushing action, it should be sprayed four inches to six inches away from the surface to be cleaned. Each package includes 12 cans of 15-ounce thin, non-foaming liquid and a one-year manufacturer’s warranty. Warnings PROP 65 (CA): WARNING: This product may contain chemicals known to the state of California to cause cancer, birth defects or other reproductive harm.